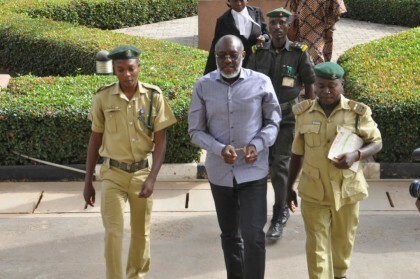 More witnesses were presented by the Economic and Financial Crimes Commission, EFCC, on Thursday, January 28, 2016 before Justice Okon Abang of the Federal High Court sitting in Abuja to testify in the ongoing case of alleged money laundering involving the National Spokesperson of the People’s Democratic Party,PDP, Olisa Metuh and his company, Destra Investment Limited. At the last sitting, January 27, 2016, Eno Mfon Efiong, a staff of Diamond Bank Plc and an account officer of the defendant, who testified as the 4th prosecution witness confirmed to the court, a credit transaction from the Office of the National Security Adviser into Destra Investment Limited account. At the resumed hearing today, counsel to EFCC, Sylvanus Tahir presented Yomi Badejo-Okusanya, a Public Relations consultant and Kabiru Ibrahim, a Bureau De Change Operator who testified as 5th and 6th prosecution witness respectively. Badejo-Okusanya, while being led in evidence, told the court that, he was paid a total sum of N77m (seventy seven million naira) by the 2nddefendant, Destra Investment Limited, to carry out media campaigns for PDP. Documents in support of his claim including documents containing evidence of payments for different placements of advertorials of PDP in various media were tendered and admitted as exhibits. Testifying, Ibrahim (PW6) told the court that, he was given the sum of $1m (one million dollars) to change and pay into the account of Destra Investment Limited, a sum whose naira equivalent amounted to N103m (one hundred and three million naira). Thereafter, Justice Abang adjourned to February 4, 2016 for continuation of trial.